We travel the world to host first class fishing trips. The finest lodges are employed during prime seasons to ensure you have the best angling experience possible. We do not guide these outing ourselves, but travel along to make certain that your trip runs smoothly. These always prove to be a great experience and we'd love to have you join us. In the spring of 2019 we will be going back to Spey Lodge in Terrace B.C. for a fun filled week of chasing chrome steelhead straight from the salt. This is by far one of our favorite trips of the year. We have been going to Spey Lodge since the spring of 2011 and have had the chance to sample the lower Skeena River and her tribs, plus a few other coastal river valleys close by and believe it’s the best spring steelhead fishery in the world. The key to finding steelhead is being able to adapt to the conditions you’re given at any time and place. Walter Faetz the owner of Spey Lodge is the best we’ve ever seen at finding steelhead, it also doesn’t hurt that he has a heck of a lot of rivers to choose from to find them. From a couple sips of coffee down the road to a quick flight in a helicopter to a river where you probably won’t see another human footprint, they are all options for our week at Spey Lodge. The accommodations are very comfortable. There are six bedrooms, each having its own bathroom and a large family room to gather after a day’s fishing to have a drink and hors d’oeuvres. The cuisine at Spey Lodge is incredible, this has everything to do with Chef Molly, her cooking is five-star. Being an hour’s drive from the saltwater has its advantages when it comes to meal planning and fresh seafood. Needless to say crab, halibut and prawns strait from Douglas channel are usually on the menu. 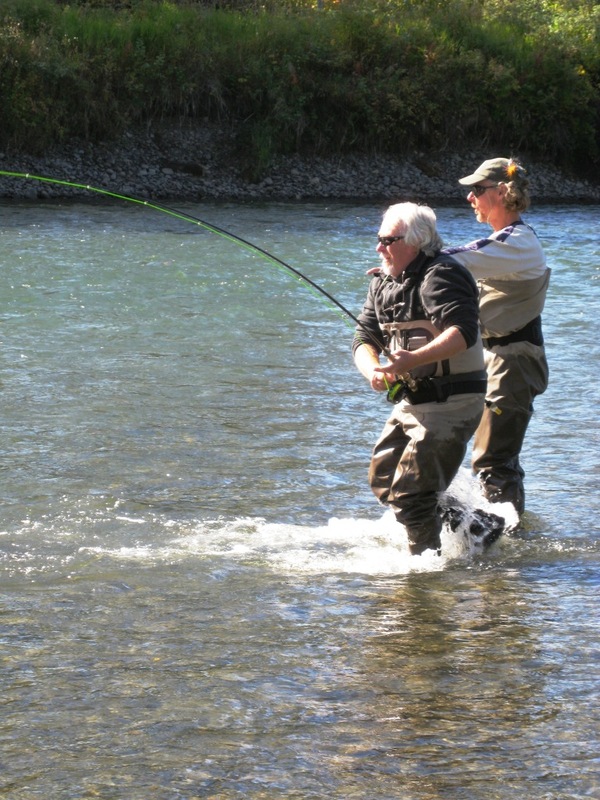 The guide staff at Spey Lodge is always top notch. These guys work for one of the most successful lodges on the lower Skeena so they are on there “A” game every day. Brian Styskal will be there to help you out when your casting develops a glitch. We will also cover customizing lines to meet your needs, fishing with a balanced set up and pretty much everything that has to do with steelhead fishing including tying flies in the evening for the next day’s fishing. If you’re a beginner to spey fishing and steelhead this week will take years off the learning curve. Our goal is to give you tools you can use to fish for steelhead on your home rivers or anywhere in the world and be successful. For further details contact us at 360-835-1420 or service@cfbflyrods.com. Fish the beautiful and secluded tributaries of the lower Skeena for hard charging, chrome bright Chinook. Wally Faetz and the staff at the Spey Lodge have spent years dialing in this amazing fishery. Spend a week immersed in the rivers of western British Columbia, being pampered by the Spey Lodge staff and swinging flies for bright Chinook. It doesn't get much better then that. Spend a week at the The Bear Claw lodge on the upper Kispiox enjoying the beauty of Northern British Columbia and it's massive steelhead. 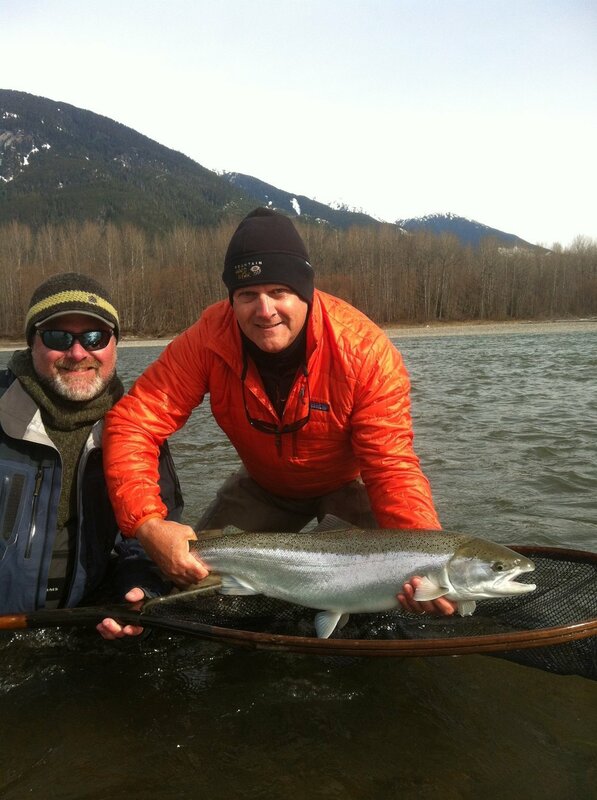 Kerry Burkheimer will be your host as you swing flies on the Kispiox, Skeena and Bulkley rivers. Contact Kerry Burkheimer for more information at cfb@cfbflyrods.com or call 360-835-1420. Puget Sound beach fishing for sea-run cutthroat and steelhead. Year-round. The owner and head guide of Arch Anglers, Ryan Smith guides for Sea Run Cutthroat on the beautiful beaches of Puget Sound. 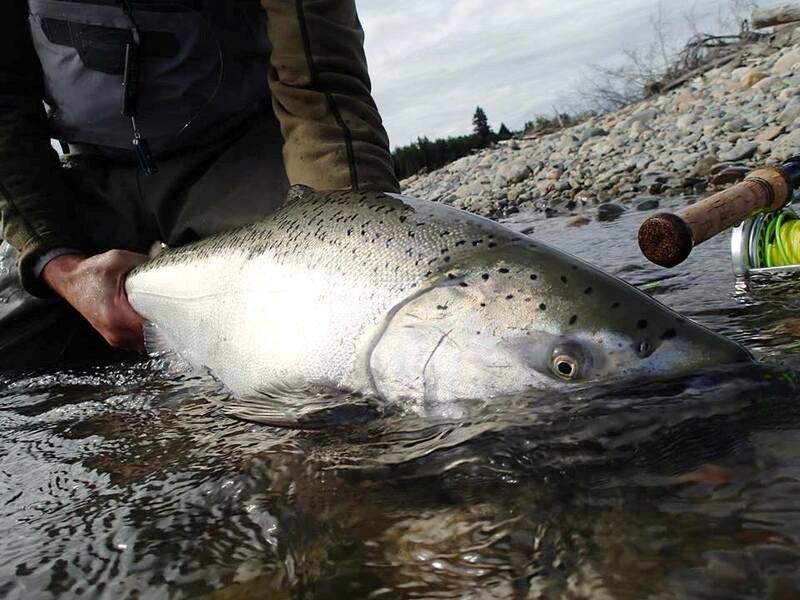 This is a unique opportunity to catch anadromous salmonids in the saltwater, and anglers are never disappointed in the experience or the fishing. Ryan and his crew are skilled casting instructors and anglers as well as knowledgeable ecosystem guides. They’ll show you the best that Puget Sound has to offer. Full day wade trips with Arch Anglers is $485 for one two anglers. Lunch included. Contact us at 360-835-1420 or service@cfbflyrods.com for further information.